We don't hear much about them now, but every day, migrants still risk their lives to cross the Mediterranean sea. However, if you scrutinise the Italian and Spanish coastguards' twitter accounts, you may conclude that the migrant crisis has ceased to be a major issue. Both these twitter accounts have stopped sharing news about migrant rescue operations, and have instead replaced it with somewhat superficial information. News about migrant arrivals to Europe, however, is invaluable for journalists and the general public, but it seems that the rise of populism and nationalism in Europe is shaping coast guards’ communication strategies. Before 2017, the Italian coastguard twitter account @guardiacostiera frequently updated the public on their search and rescue operations. Below for example, the account highlights six rescue operations where 750 migrants were saved. But since March 2017, the account posts have instead been about awards and ceremonies, seizures of fish products and safety tips. The same goes for the Spanish coastguard @salvamentogob: until December 2018, the profile proudly shared rescue operations of migrant boats. The tweet below details how 94 migrants were rescued from six boats. But now, the account now posts photos of sunsets, and whales and dolphins playing in the ocean. Euronews analysed thousands of tweets from these accounts to highlight this shift in communication strategy. Are communication strategies changing due to political pressure? In Italy, most people are familiar with Deputy Prime Minister Matteo Salvini’s ‘closed ports’ policy but what of Spain? The upcoming general election this month and the rise of the far-right anti-immigration party Vox, has coincided with this ‘information blackout’. Spain’s Prime Minister Pedro Sanchez has been accused of trying to look ‘tough’ on immigration because of political pressures to appeal more to the centre ground. Sanchez recently made the decision to move four of the coastguard's boats from the southern Spanish coast facing northern Morocco and Algeria, where most of migrant rescues took place last summer, to areas that receive a lot less migrant traffic, which can put migrant lives in danger. The PM's recent measures are contradictory to the behaviour he adopted last year. He accepted the Aquarius boat in June 2018 that had 629 migrants on board, which had been sent back from ports in Italy and Malta. Ignacio López Cano, the Maritime Security and Rescue Society (SASEMAR) director, in charge since early 2018, has been at the forefront of changes in communication strategies. The Spanish Coastguard told Euronews they're preparing a new digital communication plan for SASEMAR, and while they decide on their new communication strategy for social media, information about their rescue operations will be available on traditional governmental channels. These are, for example, reports published by the Home Affairs Minister every 15 days. SASEMAR's tweets were among the most useful sources for journalists, a report by NGO Málaga Acoge shows. An El Pais investigation shows that the Spanish Coastguard have never been as busy as in 2018, when a third of the rescue operations were carried out in Moroccan waters. This is not reflected in the number of tweets from their twitter account, which have declined massively since 2017 as the graph below shows. The figures for 2019 make compelling reading. This doesn't mean migrant flows have stopped, in fact compared to 2018, migrants' arrivals at sea have actually increased by 66.3%. 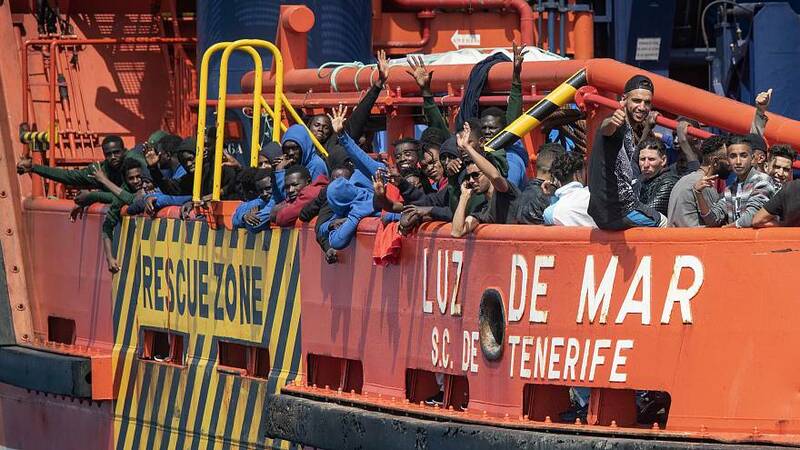 This represents 5,776 migrants who have arrived in Spain in 2019, according to the International Migration Organisation (IMO). The United Nations High Commissioner for Refugees (UNHCR) have similar numbers. The UN told Euronews that its data is collected independently: it is based mainly on staff presence for migrant arrivals, and therefore does not depend on coastguards for information. Why would Italy hide a decrease in migrant arrivals? Italy's Coastguard last tweeted about migrants on March 5 2017. At around the same time, Catania's prosecutor, Carmelo Yuccaroà, started investigating NGOs following accusations made by the director of Frontex, the European Border and Coastguard Agency. Fabrice Leggeri claimed NGOs were "making it more difficult for European security authorities to investigate trafficking networks". For the time being, the investigation has not reached any conclusions. In October 2017, a group Italian journalists made an appeal to an institutional body about coastguards and the lack of information they were giving to the press. Journalists were not given any information about migrant arrivals, even in press releases, and reporters were kept away from ports, making it impossible for them to collect any information. Italy has recently seen a drastic decrease in the number of arrivals of migrants in 2019, going from 23,370 total arrivals in 2018, to 551 in 2019, according to the IOM. This being the case, why would there be a policy of non information, when the anti-migrant stance appears to have done the job it was intended to do? Matteo Villa, from the Italian Institute for International Political Studies (ISPI), explains that this absence in communication correlates with the coastguards' disengagement to carry rescue operations beyond Italian waters. He added that information about migrants at sea is now directly passed onto Libya, whose coastguards sometimes does not respond for many hours. Information about migrant arrivals is still available on the Italian Coastguard website, which publishes reports about Search and Rescue activities in the Mediterranean every month, although they have stopped publishing since December 2018. The Home Affairs website is also updated daily. Those websites show that this absence of tweets does not reflect the reality of the migrant crisis: this year, 551 migrants have arrived on Italian shores up to now, and in December 2018, 46 people were rescued by the coastguard. There were no tweets about this whatsoever, as the graph below demonstrates. "We treat migrant arrivals as autonomous arrivals", Villa explains, "we try to lower the level of information and the importance of the events. If Coastguards were to communicate the information, the ports could be closed off in the same way the Diciotti port was in August. If boats arrive within 12 miles of the ports, then we are required to bring them into the port. And the Home Affairs Minster can't do anything about that." A lot of migrant boats therefore disembark on their own, without any intervention from Coastguard, and this is what Professor Eugenio Cusumano calls "ghost landings". Cusumano published a study on the hypocrisy of institutional communication of Search and Rescue missions. Cusumano explains there can only be two scenarios of migrant arrivals in 2019: Search and Rescue operations that take place in the Italian Search and Rescue area (and are not communicated to the media), or "ghost landings". Neither the Italian Coastguard's spokesman, Commander Cosimo Nicastro, nor Frontex commented on this situation. In Greece, the migrant crisis has not stopped either: the IOM calculated 5,621 migrant arrivals in 2019, and UNHCR calculated 5,492. But contrary to Spain and Italy, the twitter account never stopped sharing their information, although their account was never as active as the Spanish and Italian counterparts. From January 2016 to April 2019, 672 of the 3,207 tweets posted by the Greek Coastguard (@Hcoastguard) were about Search and Rescue operations. The frequency of these tweets reflect migrant flows to Greece: although fewer migrants are coming, they have never stopped coming since summer 2016. In 2016, there were 270 tweets; 229 in 2017; 165 in 2018 and just 8 (out of a total of 40 tweets) in 2019. "We haven't changed the way we work. The flow of migrants is decreasing, so communications are too. But you’ll have to ask Spain and Italy why [they stopped sharing this information]." A spokesperson for Sea Eye, a Dutch organisation that rescues migrants, Carolatta Weibi, says they too feel the impact of the information blackout. "When we are off the Libyan coast, we used to be told about migrants in need and go rescue them, and when we did, we handed them over to coastguard ships that brought them back to the coast. We never used to have to bring them back, we were really only ever there as first-aiders. Now, we hardly get any information from Rome and Malta. They report everything directly to Libya, and we are left out of the loop. We only have one rescue ship, and the area we cover is so big, we can't rescue everyone. Sometimes, we get help from our colleagues' search planes. Nevertheless, we know many boats will sink unseen. Everything is done to prevent these people from even coming near Europe." The information blackout is not just misinforming the media and the public, but it is also putting more lives at risk. According to the IMO, since the beginning of this year, 289 migrants are either missing or have lost their lives.